John, Nick, and JaVale. Together Again! What could go wrong? After a while, JaVale aka Pierre ended up turning jug life into a charity to help people in foreign countries who don't have drinking water, and to help promote drinking water to stay healthy. You can read all about his charity here (and you can buy some bizarre products there too with money going to the charity, the $18 foam jugs is my favorite...WTF). 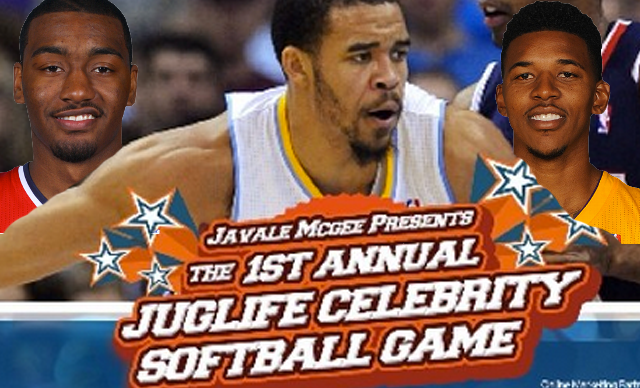 To raise some more more money for charity, JaVale called up some of his old Wizards buddies (Nick Young, John Wall) along with some other NBA Players (Kevin Love, Ty Lawson, Nate Robinson) and got them to participate in a softball game out in L.A. this Sunday. So that should be good for John, some more time with Nick Young and JaVale McGee.